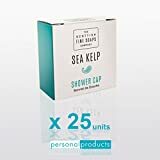 As a Hotel Guest Amenities the Sea Kelp Shower Cap is the perfect accessory for those who want to keep hair dry in the shower. This entry was posted in Buy Supplements and tagged Bonnet, Douche, Kelp, Shower by TOSMS. Bookmark the permalink.